Regulars might recall when I installed a copy of Ubuntu Linux last summer .. an operation I prepared for by creating a separate 20-gig partition (on my new hard drive), which I formatted as EXT3. Somebody in the forums (Nigel, I think) suggested using VMware (.. either the freebie 'Player' or full-boat 'Workstation' ..) to run a 'virtualized' installation. I initially balked at the idea .. cuz I didn't grok how virtualization works. But you don't need to understand how an automobile works in order to benefit from driving one. Same goes for virtualization. And the benefits are substantial. The coolest thing about 'virtualizing' a Linux installation .. is that you can run it from (within) Windows .. just like you can run Photoshop (from Windows) .. or any other Windows-program for that matter .. multitasking all of them at the same time. I found that .. if you can only use/access Linux by booting into it (and thus leaving Windows behind), you're less likely to use it (.. or so it has been my experience). So last week I deleted my EXT3 partition, and reformatted it as NTFS .. where I installed a virtual machine containing Ubuntu 8.10 'Intrepid Ibex'. Intrepid even found my wireless adapter upon initial boot-up. (Woo-hoo!) No more having to troubleshoot wireless connections and installing proprietary drivers just to get internet access. Continue reading Best Way to Learn Linux » Via an Ubuntu Virtual Machine. Installed Linux this weekend » Ubuntu 8.04 (released April 2008). Woohoo! I'm stoked. Installation couldn't have been easier. After creating a 20-gig Ext3 partition on my new hard drive (see previous entry), I answered a few simple questions, stated my time zone and » Voila! But then I booted up and couldn't connect to the internet. Ugh. Learned since that 'Wireless' is one of Ubuntu's biggest weak-spots. Gotta be the worst place for a weakspot. Cuz everybody is wireless these days. And without internet, your PC is pretty-much worthless. I was tempted to give up. Tried many networking configs. Nothing worked. I even carried my laptop to the coffee shop, where they have free internet, with NO password (WEP/WPA), and I still couldn't connect. So it wasn't an encryption problem (like I thought). 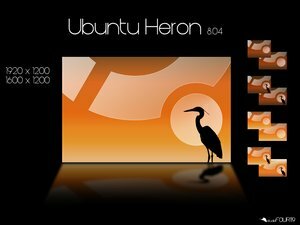 Continue reading Installed Ubuntu Linux 8.04 (Hardy Heron).